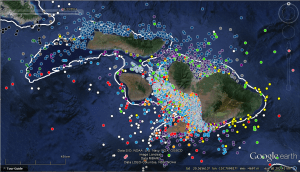 University of Hawaiʻi at Mānoa researchers are using tracking devices to gain new insights into tiger shark movements in coastal waters around Maui and Oʻahu. The ongoing study reveals their coastal habitat preferences. “We need to understand tiger shark movements in our coastal waters to gain a clearer comprehension of the circumstances bringing sharks and humans together,” said Kim Holland, senior shark scientist at the Hawaiʻi Institute of Marine Biology. In 2013, internationally recognized shark scientists Holland and Hawaiʻi Institute of Marine Biology Associate Researcher Carl Meyer started a tiger shark tracking study in Maui waters, following a cluster of shark bite incidents around Maui in 2012 and 2013. Twenty-four large tiger sharks were captured and fitted with tracking devices off Kīhei, Olowalu and Kahului, Maui. The tagging efforts are providing new insights into the coastal habitats most frequently visited by tiger sharks around Maui. Around Maui, the coastal sites frequently visited by tiger sharks are directly offshore of popular surfing and swimming beaches. Last month, the team of scientists began tagging large tiger sharks off the north shore of Oʻahu to determine whether similar patterns of behavior occur around other Hawaiian Islands. 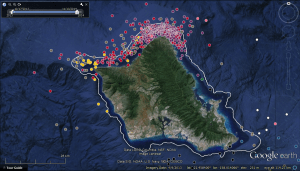 Tiger shark tracks are available online at the Pacific Islands Ocean Observing System website.